2Gen (a family literacy program) is a nationally recognized and innovative educational approach with a powerful premise. It brings students and families together to learn—challenging parents, guardians and their children to identify academic and life goals that will improve the quality of their lives. During part of the school day, adults receive basic lessons in language and literacy, as well as parenting skills. The rest of the school day, they spend time in their children’s classrooms, learning math right alongside them. Programs like these have a broad impact by fostering the development of the connecting language in our increasingly globalized community. The Foundation for Lincoln Public Schools has identified 2Gen as a priority project and works to engage community partners to fund this vital work. The goal is to reach 50% support from the community. Wells Fargo is one of those community partners, and an important supporter of the 2Gen program, not only financially, but also by encouraging their employees to volunteer. Over the past three years, Wells Fargo has given $25,000 to support the program. Tammy Peters, a Wells Fargo employee, teaches financial literacy to parents during the program. She does four sessions per class, teaching the basics like how to write a check, what to look for when you receive a check, even how to do an entry into the register. "I am extremely passionate about personal finance," Peters said. "It is so rewarding to give back to my community through that education piece. People learn the basics about how to live in Lincoln, Nebraska. For many, banking is hard—maybe they didn’t have banking in their home country." 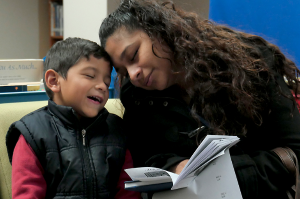 Currently, there are about 3,100 English Language Learning Students in our district, and as Lincoln's refugee population grows, 2Gen makes a remarkable difference for those who participate in the program. 2Gen is currently in 11 schools, and programs have between 14 to 20 families in each school. The cost to get a site up and running is approximately $50,000 or $25,000 to add a new session at an existing school. Peters notes that teaching was an excellent customer service experience. Professionally, it helped her step back and understand how “common” things were maybe not so common. "It reminded me that not everyone has the same understanding," Peters said. She took this information back to managers at branches so they understood the barriers and the questions that were being asked so they could be prepared for them. "It was nice for participants to find out that there are bankers who speak their language," Peters said, "and to send people to those banks." Some of the languages spoken at Wells Fargo branches include Spanish, Hindi, Arabic and Farsi, among others. In addition to English language skills, parents also learn cultural proficiency, life skills, job skills, parenting skills, homework tips, support in raising bilingual children and many other critical skills to help families honor their cultural heritage while adapting to life in Nebraska. "I am extremely proud of Wells Fargo," Peters states. "They commit to their communities." She notes the Wells Fargo at Work program, a financial wellness piece, is offered for free to everyone. "Communities thrive if we can get people to understand how finances work." For more information about the 2Gen program, go to foundationforlps.org/2gen.